ELLTA, which stands for Exploring Leadership and Learning Theories in Asia, invites contributions to highlight Asian perspectives on Creativity, Innovation and Entrepreneurship. Given the enormity and diversity of challenges facing the world at large, and Asia, in particular, the transformation of societies requires creative and innovative responses, and individual and collective entrepreneurship. ‘Creativity, Innovation, and Entrepreneurship’- as expressions and embodiments of Leadership and Learning – are, thus, the key catalysts for social transformations in the contemporary Knowledge Era. This realization and recognition is on the rise: For instance, India declares 2010-2020 as India’s ‘Decade of Innovation’; Malaysia celebrates the Year 2010 as the Year of Innovation. The ELLTA Conference 2012 is an extremely important undertaking, not only because of its emphasis on showcasing and knowledge sharing of creativity, innovation and entrepreneurial efforts and initiatives, but, more significantly, because it brings in the Asian Perspectives on the current theme. The majority of the theories (e.g. theories on ‘leadership’, ‘learning’, etc. ), though claiming to have global application, in effect, originates in different parts of the Western world. This raises an important concern: Is it wise to assume that all these theories are universal in nature and could equally be applied to all contexts? ELLTA is an initiative that challenges the hegemony of West-inspired theories and their basic assumptions. The first academic conference, Exploring Leadership and Learning Theories in Asia Conference 2011, has made a valuable contribution in addressing this concern, and in highlighting understandings on Asian perspectives on leadership and learning. ELLTA 2012 further extends this agenda and takes up, as its theme, the Asian Perspectives on Transforming Societies through Creativity, Innovation and Entrepreneurship. Are the west-inspired theories on Creativity, Innovation & Entrepreneurship relevant for Asia, in general, and different contexts in Asia in particular? Is there a need to develop theories specific for Asia in general and different contexts in Asia in particular? Are there existing theories of/on Creativity, Innovation & Entrepreneurship with an Asian origin, which have not received much attention or have not been acknowledged so far? What are the current theories and practices available on Creativity, Innovation & Entrepreneurship in Asia, in general, and different contexts in Asia in particular? What are the roles of the education systems, education institutions, educational leaders in the leadership for learning regarding Creativity, Innovation and Entrepreneurship? The Conference engages a wide range of individuals and organizations, working in diverse fields, e.g. Science and Technology, Business and Economics, Social Sciences, Philosophy, Development and Sustainable Development Studies, Education, etcetera. Abstracts (400-500 words) can be submitted on line by September 15, 2012. Look forward to meeting you in Malaysia ! 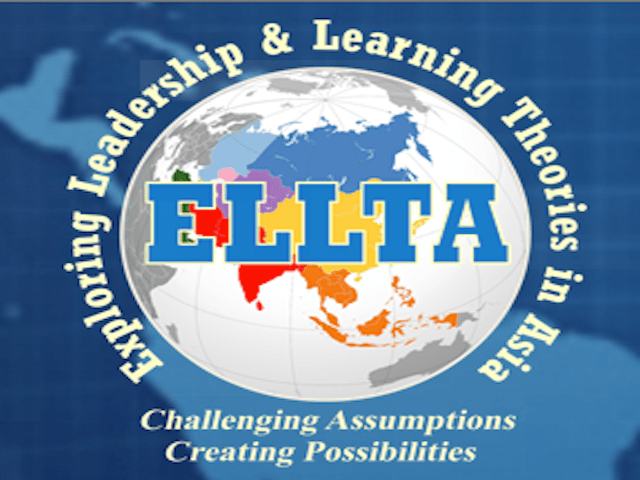 Exploring Leadership and Learning Theories in Asia (ELLTA) is a not-for-profit volunteer initiative, a non-government organisation of credible domain experts drawn from diverse fields and disciplines across the globe. The organisation is religiously and politically independent and aims to explore, understand, recognise, strengthen, encourage and promote existing theories (and thereby policies) and practices of leadership and/or learning in Asia. Majority of the social theories which claim to have global application originates in different parts of the Western world, which raises a serious concern: Is it wise to assume that all these theories are universal in nature and could be equally applied to all contexts? Three scholars and friends with a common understanding of academia as a platform where assumptions and myths are challenged rather than maintained thought that it was time to start to explore theoretical contributions other than those coming from the Western part of the world. We chose to focus on two main areas that are not only our teaching and research interests but are also important areas when it comes to people’s beliefs; these are leadership and learning. Both leadership and learning are relatively ‘soft’ and abstract areas, which provide a lot of space for generalizations, such as being treated as global or universal, which needs to be debated. This was our motivation behind selecting these two, in conjunction, or separately, as core themes for our deliberations. Moreover, leadership and learning are important areas when it comes to people’s beliefs; political, symbolic and business leaders have a major impact on our lives, as well as the school and university leaders, and – not the least – those who lead the learning that takes place in those organizations: the teachers. Learning and leadership, thus, seem to be two very broad areas with a great importance for issues such as globalization and whether ideas and theories are universally applicable, whether they have to be adapted to the local contexts, or whether they are context-dependent and thus have to be locally designed and developed. The choice fell on Asia for various reasons: One is that two of the three who took the initiative are from Asia. Another reason is that Asia is a hot subject which is going through a major development, and thereby challenges the Western world. It is, therefore, interesting to take up questions like whether the many different contexts in Asia are merely copying the Western “success”, or is there something that Asia has actually been contributing, something that other parts of the world could also benefit from. A response to these questions needs an exploration! We definitely do believe that Asia has a lot to offer, and this is the main reason why we thought that it is time to start ELLTA and to organize conferences around these topics. The ELLTA 2011 conference was our first mission on a long journey. We are aware that as a response and reaction to the predominant presence of social theories rooted in the West, there is a growing recognition of and movement towards understanding theories through the wide range of diverse contextual and cultural perspectives available in the East, and that the production of local theories have started a long time ago. However, we want to give them some more attention so that the voices/ work could get more strengthened. We hope that there will be many other similar conferences and other events in the future, giving light to local theories in Asia, Africa, South America and other parts of the world that usually receive (too) little attention in the world of ideas and theories. • Are the west-inspired theories on leadership and learning relevant for Asia in general and different contexts in Asia in particular? • Is there a need to develop theories specific for Asia in general and different contexts in Asia in particular? • Are there existing theories on leadership and learning with an Asian origin, which have not received much attention or have not been acknowledged so far? Thus, there is a need to examine/challenge generalizations related to learning and leadership across cultures and geographical boundaries, between East and West, but of course also between Eastern contexts. That is where the ELLTA conferences offer a significant contribution. Not only do the conferences, but also the publications that follow the ELLTA Conferences (including Special Issues in prominent journals) provide an important venue for disseminating the Asian perspectives to a wider audience. The ELLTA initiative, though started in 2009, has already received a very warm reception across the globe. The scholars, professors and researchers who have accepted to serve on the International Advisory Board, the journals who have offered to consider Special Issues, the universities that are willing to host the past, current and future ELLTA conferences, the large group of colleagues, fellow-researchers and community of scholars associated with ELLTA – these are just a few indicators. Other indicators include an overall support for the initiative and offers received for voluntary participation to contribute to the initiative. We are glad for the recognition that the initiative has received in a short while, and thankful to all those who have contributed o making ELLTA what it is today.